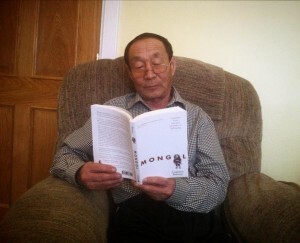 My dad arrived from Mongolia ten days ago to celebrate Christmas, New Year and my first book launch event in Glasgow. It’s lovely to have my dad with us. He is very proud of me holding my memoir in his hands and flicking through the pages spotting the occasional Mongolian words and sentences. I made sure I wrote the dedication to my parents in Mongolian. Харцаараа бүүвэйлсэн аавдаа энэхүү номоо өргөн барья. ‘Mummy, milky!’ our two year old demands and follows me like a shadow to the kitchen. ‘Let’s play football!’ our 8 year old kicks a ball in the hall. Their big sister, the teenager hardly shows herself studying for her exams. Fortunately, my husband is on holiday for a few days to take the ‘big’ boy out to play and burn off that boiling energy. My dad observes. ‘You did well, writing your book with your busy family life.’ That comment felt good. On Monday, I was interviewed by Spain’s English speaking radio Talk Radio Europe. After a bit of a problem with our phone connections we managed to do the interview. The presenter Dave Hodgson was a lovely guy, very easy to talk to. I’m hoping to do more interviews for radio, TV, newspapers and magazines this new year. We made a book trailer recently for ‘Mongol’ too. As my Weegie Wednesday friend Moira McPartin said in her email 2014 will be massive for me. The big year kicks off with the book launch event in Glasgow on 16th January in Waterstones, Argyle Street. We are very excited about 2014 and I hope you too have a happy 2014. Please keep checking the events page and come and say hello if I’m coming to anywhere near your town. This entry was posted in Mongol Memoir on January 2, 2014 by Uuganaa. Hi dear! What an excitement to start the new year! Congratulations again. I’ll make sure to get it via a colleague who’s in London at the moment. Can’t wait to hold and read it!